Taz Thornton specialises in self-belief, confidence, personal brand and visibility and delivers motivational speaking like never before. In this episode Taz speaks openly about her experience of domestic abuse. We both share our feelings around it, and how we each removed ourselves from the situation. She’s been there, done it and seen it in ways that will make you change your view of the world and want to do better. As a high-flying corporate director, she appeared to have the world in her palm – nobody could see her crumbling beneath the pinstripes. She rebuilt after breaking her back at 21, then fought back after the breakdown at 33 that saw her seeking wisdom from shamans and medicine people, as well using every tool in her NLP and coaching toolkit to reconstruct her life. That breakDOWN turned out to be Taz’s breakTHROUGH, and she’s now impacting people far and wide as the UK’s #1 Inspirational Breakthrough Speaker. 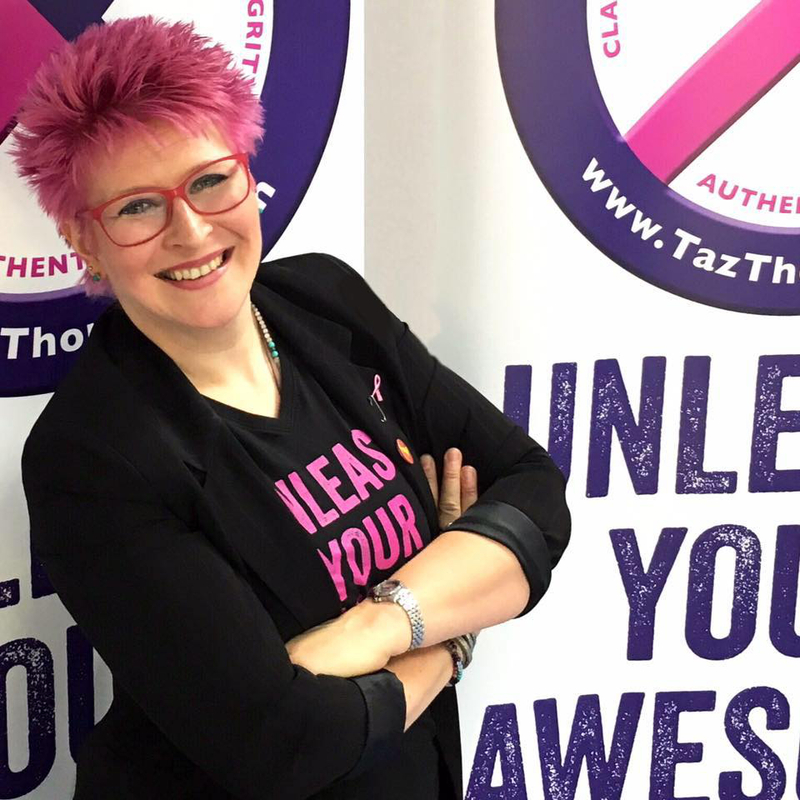 Taz used her unique skillset to create the #UnleashYourAwesome empowerment seminars to rave reviews – stepping people in business out of demotivated uncertainty into a place of power-full change and motivating them to create a life far less ordinary. In 2018 she launched The Heart Of Speaking – a two-day intensive retreat experience for people who want to learn the art of public speaking – particularly those who want to deliver their own authentic story. Her first book hit the Amazon best sellers list within the first few days of publication and is still pulling in five star reviews. Her second book – Unleash Your Awesome – sold out four times in the first week! She’s commissioned to write two more – More Whispers From The Earth and Stop Moaning, Start Owning – in 2018. Trained with the same team who taught Tony Robbins to add firewalking and extreme empowerment skills to her offering – don’t be surprised if she has you walking over broken glass or breaking arrows with your throat to help you unleash your awesome! Hand-picked to be a show co-host on American talkshow network America Out Loud, as well as a weekly columnist. Regular guest on BBC Radio, plus featured on ITV and Sky TV, as well as being seen in Huff Post, Kindred Spirit, Spirit and Destiny, as well as being an invited TEDx speaker, plus named on the DIVA power list and as one of the leading evolutionaries on Source TV. Taz gets people speaking honestly like you’ve never known – her unique blend of ‘tribal’ communication tools learned from shamanic cultures, NLP skills and years in top-line management means she can get right to the issues holding you and your company back. Workforce not communicating effectively? Production too slow? Too many ‘personality clashes’? Low energy office? Get ready to get right to the heart of the challenges and get ready for change! No more ‘rags to riches’ clichés, just real, achievable inspirational breakthroughs for real people ready for change. "Wow. Wow. Wow. I just witnessed Taz absolutely captivate an audience at the largest business show in Europe. Cards on the table, I’m a motivational speaker, but I just got schooled – an absolute masterclass in how to engage and hold an audience - not just with great stories and energy, but with warmth, humility and, importantly, humanity." Brad Burton, UK's #1 Motivational Business Speaker, Founder 4Networking.